In medical terminology, a sign is any indication of a medical condition that can be objectively observed by a doctor. When an adult has difficulty with concentrating, it is rarely attributed to a disorder like ADD/ADHD, but often, overlooking that possibility is a mistake. Adults can indeed suffer from ADD/ADHD, but they are much less likely to be diagnosed with the disorder because of the cultural idea that it is a disorder experienced only by children. Keep reading to learn about the signs of ADD/ADHD in adults. The signs of ADD/ADHD are found primarily by asking about symptoms, so it can be helpful to know what symptoms exist for this disorder. There are three categories of ADD/ADHD that influence the types of symptoms: inattentive, hyperactive-impulsive, and combined. 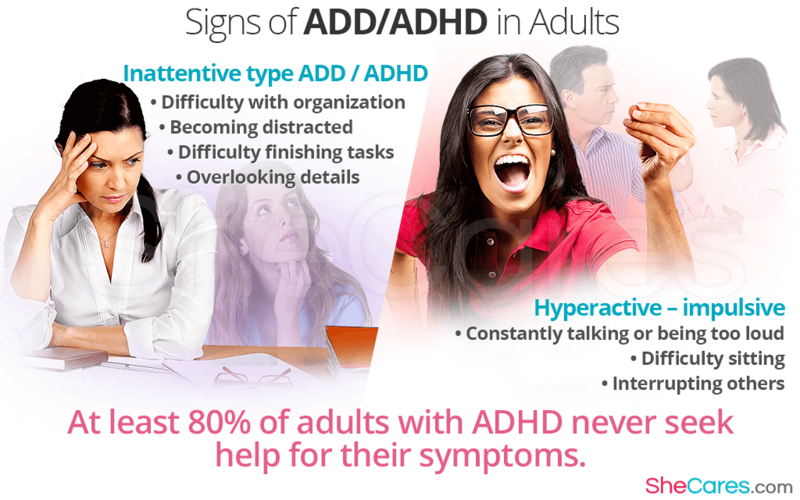 There is also a combined type of ADD/ADHD, in which people exhibit symptoms of both previous types. Because there is no physiological marker for ADD / ADHD, all diagnoses of the disorder are made through interview and scales that rate symptoms. During these tests, a trained professional - usually a psychologist - will conduct an interview and ask you for information about the symptoms you experience. This is called a self-report test, since you are reporting your own symptoms. They may ask for information about the frequency of your symptoms, or they may ask about the severity. Often, these tests will assign numerical values to symptoms, as well as to the frequency and severity of symptoms if those measures are included. The signs of ADHD in adults, and the diagnosis of the disorder, depend both on the numerical value reached at the end of the test and the doctor's assessment of your symptoms. Some common diagnostic tests for ADD / ADHD are the Conners Adult ADHD Diagnostic Interview and the BADDS Diagnostic Form. Knowing about the symptoms and signs of ADHD in adults can be helpful for determining whether you need to see a doctor for your concentration problems. To learn more about helping concentration, check out an article about how to concentrate and focus while reading.